The open ocean, called the high seas, lies outside the boundaries of any country, making up nearly two-thirds of our ocean and providing 90 percent of the habitat for all ocean life. But only about half of 1 percent of the high seas are fully protected from fishing, mining, and other human activity. Delegates from more than 100 countries met at the United Nations in New York in September 2018 to start negotiating a treaty to try to change that. Half the planet is at stake in this fight. Help us protect the precious ocean life that lives in the high seas, for generations to come. 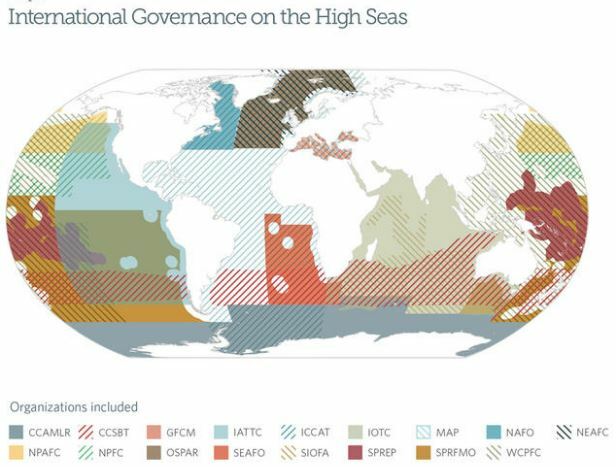 Notice where two, or even three, organizations share authority for the same spot in the ocean. The area directly south of Africa, for example, is within the jurisdiction of the Commission for the Conservation of Southern Bluefin Tuna, the South East Atlantic Fisheries Organization, and the Convention for the Conservation of Antarctic Marine Living Resources, in addition to the global bodies that control shipping in the region (the International Maritime Organization), seabed mining (International Seabed Authority), and various other treaties (e.g., the Convention on Migratory Species). Each of these agreements and organizations have different standards and requirements governing human activity, and there is little or no cooperation between them. This uncoordinated governance is not a good thing—and not just because there can be a conflict of authority. To draw a comparison, think of what could happen if there are eight doctors treating the same patient without talking to one another.